I had no idea when I was planning this autumnal set up that I had a little redhead coming in to be photographed. I couldn’t have planned it better if I tried! The newborn photography community in the UK is great and whenever someone finds a new prop or gets a new idea, they are always willing to share. When someone posted that they had found some amazing fake leaves in The Works, I went straight into Hemel Hempstead town centre to get some for myself. Add in some mini pumpkins from Tesco and a gorgeous new autumnal headband and the set up was complete. 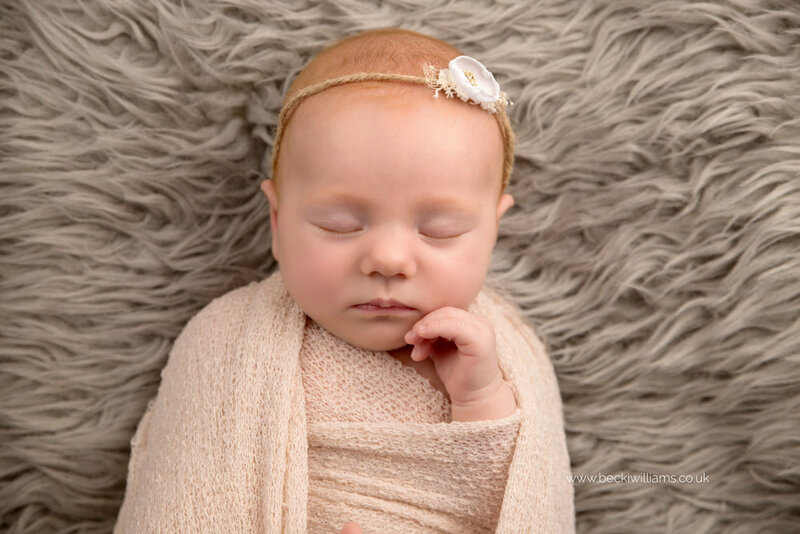 Whenever I get an older newborn like Honey come in for a photo shoot, I always let parents know that as their little baby is a bit older, they may be a bit more alert and less likely to sleep. You never can know for sure though, as when Honey was wrapped, she was happy to snooze away. Once unwrapped, Honey was awake and alert and ready for me to capture those gorgeous eyes. Photo shoots with older babies are less about posing and more about capturing their personality and expressions. I love a parent who is willing to join in and help to get their baby to smile, even if it means making the most ridiculous noises or doing a funny dance. Picture it now - Honey’s mum and I standing over her making loud Cooeee noises together to get that gorgeous grin. Totally worth it! When people ask me what age baby is my favourite to photograph I can never pick - each stage has something special about it. At Honey’s age, I love seeing those first smiles and being able to capture them for mum and dad. And if I get a giggle - well that just makes my heart melt!! If you liked Honey’s pictures, keep your eye out for blogs to come as I went on to photograph half of her NCT group! Hi, my name is Becki and I am a Newborn & Baby Photographer based in Hemel Hempstead, Hertfordshire. If you’re looking for a relaxed, laid back photo shoot with your baby, I may just be the lady for you! 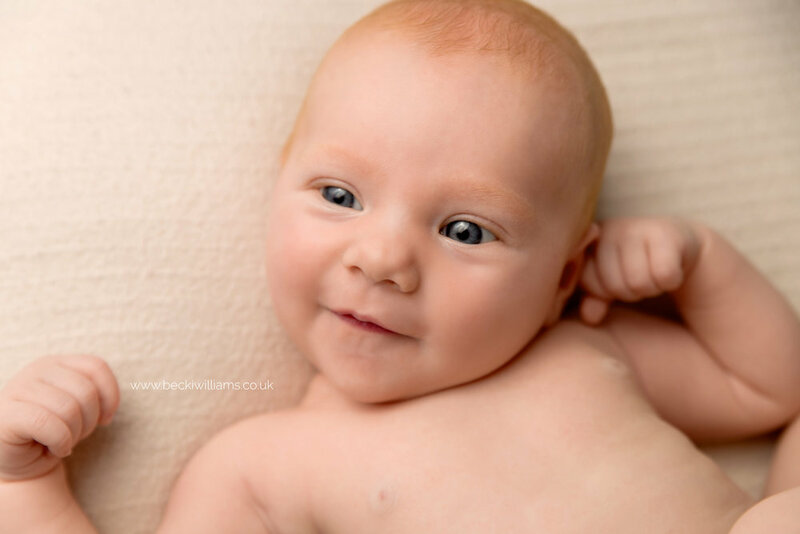 The majority of my photo shoots take place at my house in Hemel Hempstead where you can sit back and relax while I capture beautiful images of your baby. Every shoot has plenty of time for cuddles and feeds and will go at the speed that you and your baby need.